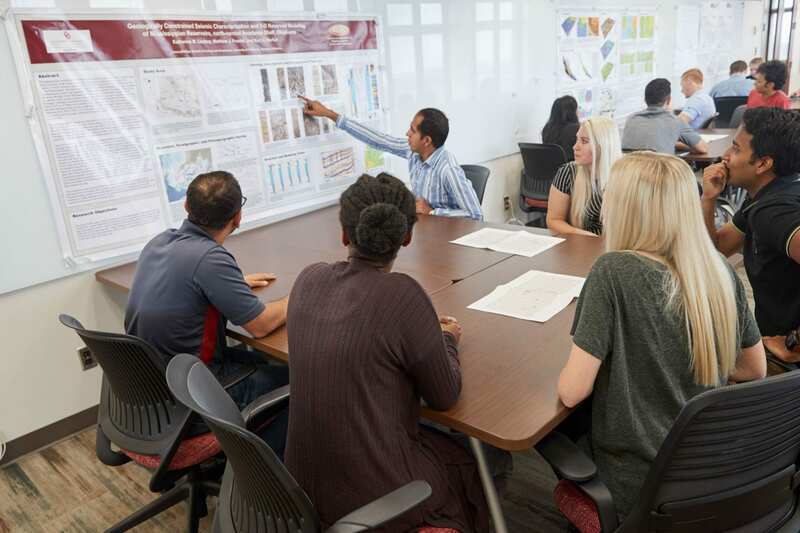 Petroleum engineering students at the University of Oklahoma will now have an opportunity to gain real-world experience working on projects for companies in the industry. Starting over the summer and officially kicking off in November of 2018, the Ronnie K. Irani Center for Energy Solutions was made possible by an investment from Mr. Irani and RKI industries, as well as SOER and OERB. The intention of the program is to operate as a real energy business right on OU’s campus — giving students valuable experience during the semester that before could only be gained through internships over the summer. State-of-the-art facilities, designed to simulate an office environment, were constructed on the 14th floor of Sarkeys Energy Center. The facilities are comprised of a common work area complete with office-grade furniture, a conference room, and a break room. Students also have access to industry-standard equipment like plotter-printers as well as all the necessary software used by industry professionals to complete their projects. “The center plays an important role in producing some of the very best, energy-savvy, new graduates in the world, graduates who – thanks to the Irani Center – may have multiple years of practical experience by the time they enter the workforce,” said Ronnie K. Irani. The program is operated through the senior capstone class, giving each petroleum engineering student an opportunity to gain real-world experience on campus by the time they graduate. Operation will continue throughout the summer and will be opened up to sophomore and junior participants. “My experience in the Irani Center for Energy Solutions was a really unique opportunity where my team was given space to develop skills and find solutions to real problems that the company trusted to us. This is a program where you have the chance to prove your work ethic and engineering prowess to the industry,” said Mewbourne School of Petroleum and Geological Engineering senior, Andrew Oakes. Currently, there are 64 students working on 14 separate projects. Some of the participating companies include Charter Oak Production, Ballard Petroleum, Spartan Energy and Kirkpatrick Oil Company. The students are not the only ones benefitting from the center. The companies themselves are benefitting from the additional resources provided by the students participating in the I-CES progam. “For the small producer, it’s a win because many may not have this kind of expertise, technology or software. Many may not even have engineers or geologists on their staff, particularly since the oil downturn. If a student could help a producer in a way that turns out to be fruitful, what a learning experience for the student and the producer,” said former OEEF Executive Director, Mike Terry. The I-CES Center is currently invested in studying four Oklahoma formations including the analysis of approximately 400 wells. 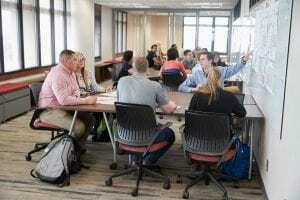 Each of the companies that participated in the program over the summer continued or added to their projects with I-CES when the program officially kicked off in the fall. The center will be seeking out projects from other companies in the future. Those projects will be accepted into the program on a first-come, first-serve basis. Students and companies interested in participating should contact I-CES program coordinator, Kierstin Nash, at kierstinnash@ou.edu.